Flat Organza Bags, Navy, 4" x 5"
Flat Organza Bags, White, 3" x 4"
Flat Organza Bags, Gold, 3" x 4"
Flat Organza Bags, Purple, 3" x 4"
Flat Organza Bags, Olive, 3" x 4"
Flat Organza Bags, White, 4" x 5"
Flat Organza Bags, Silver, 3" x 4"
Flat Organza Bags, Burgundy, 3" x 4"
Flat Organza Bags, Olive, 4" x 5"
Flat Organza Bags, Copper, 3" x 4"
Flat Organza Bags, Lavender, 3" x 4"
Flat Organza Bags, Ivory, 3" x 4"
Flat Organza Bags, Copper, 4" x 5"
Flat Organza Bags, Red, 3" x 4"
Flat Organza Bags, Light Pink, 3" x 4"
Flat Organza Bags, Black, 3" x 4"
Flat Organza Bags, Gold, 4" x 5"
Flat Organza Bags, Silver, 4" x 5"
Flat Organza Bags, Ivory, 4" x 5"
Flat Organza Bags, Light Pink, 4" x 5"
Flat Organza Bags, Navy, 3" x 4"
Flat Organza Bags, Purple, 4" x 5"
Flat Organza Bags, Black, 4" x 5"
Flat Organza Bags, Light Blue, 3" x 4"
Flat Organza Bags, Light Blue, 4" x 5"
Flat Organza Bags, Lavender, 4" x 5"
Flat Organza Bags, Red, 4" x 5"
Flat Organza Bags, Silver, 6" x 14"
Flat Organza Bags, Burgundy, 4" x 5"
Flat Organza Bags, Turquoise, 4" x 5"
Organza Bags are one of the most versatile products for any retail store and are the perfect finishing touch for packing delicate items such as rings, pendants, food, candy and more! Their sophisticated, yet fun see-through fabric makes them great for weddings, birthdays and anniversaries. 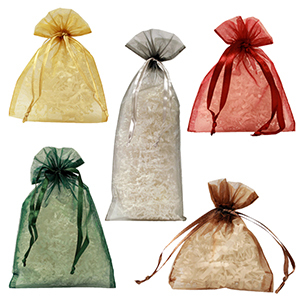 At American Retail Supply we offer flat and gusseted organza bags in 25+ different colors and 5 different sizes! Organza Bags also work great as a pre-made gift to sell to your customers as an east present to give for whatever occasion!